I have been a fan of Hell Bunny for so long now and I was super excited that the current season featured trousers. The button detail on the front is gorgeous and the fabric is really comfortable too. I absolutely adore the top too, I plan to pair it with my nautical Hell Bunny shorts in Summer for another cute look! I find both the top and pants fit true to size, I generally wear xs in Hell Bunny and there is an inch or so spare room in the trousers. I really love them, I must add the navy version to my wardrobe too. My shoes are surprisingly comfortable, as I usually walk for 20-30+ minutes at the waterfront, I always forget that I have these platforms. No photos with the dogs today, though they did run through a some of the shots. They were busy meeting and greeting with other dogs during this short stop on our walk. The dogs approved of the the nautical ensemble on this beautiful day too. I love those pants! I wish I could pull wide legged pants off! And the location for your photographs is also so nice. Incredibly cute outfit! I love the theme and the look of this shoot, you look absolutely adorable. This might be a silly detail to pick out, but I'm really digging your fluffy little ponytail, it's so darling and 1950s. 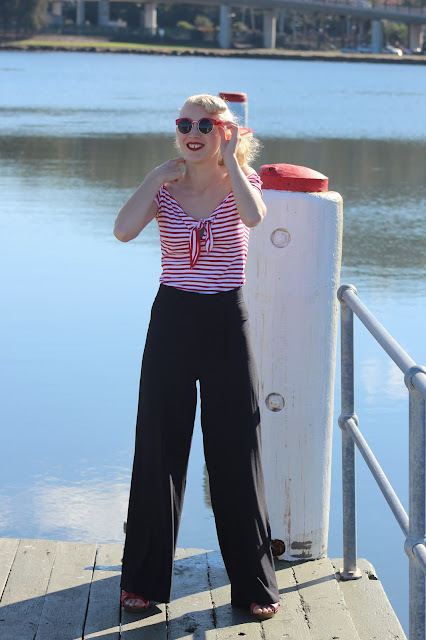 I must get a pair of these trousers - they look fab! I'm so excited that Hell Bunny has branched out into pants and am hoping to high heaven that one of the teeny, tiny number of online Canadian (HB) stockists will bring some in. I've had the most luck fit wise with Hell Bunny than of any other repro/vintage style brand I've tried over the years and I like to think (and cross my gingers that) that would apply to their pants - a notoriously tricky garment for me historically in general - too. You look so lovely and ready to spend a relaxing day on the open water - or at least near it, as you are in these shots. I really like that you went with a ponytail here, it compliments the off-the-shoulders cut of the shirt so nicely. Beautiful dress and style and I really love your outfit, Such a perfectly outfit !